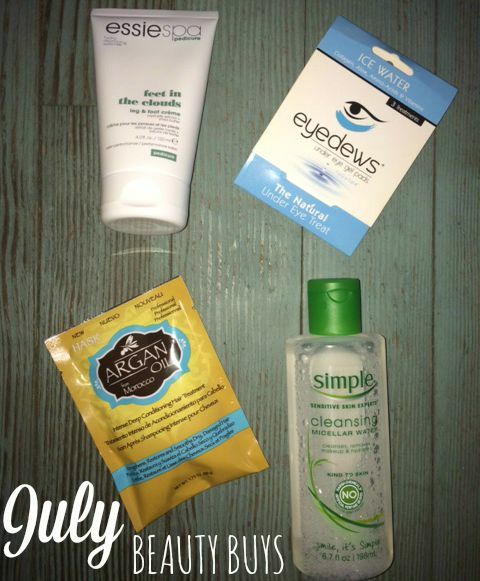 Last month I was grateful to find some much needed beauty products to combat the effects of summer. From a quick remedy for washing my face when I'm too tired for a proper cleanse to a foot lotion that transforms dry, overexposed feet, July's beauty buys are keepers. My feet have taken a beating this summer. From going barefoot at the pool and the beach to wearing sandals every day, my skin is dry, crackling, and unattractive. After trying several lotions that promised to fix my feet, I finally decided it was time for essie's "feet in the clouds" lotion. I've never looked back. This lotion will transform your feet in just two applications. I like to apply it at night and put on light socks and again in the morning before I get dressed for the gym. I don't know if it's the extreme heat or perhaps environmental factors, but I've never experienced puffiness under my eyes as I have this summer. Eyedews are collagen-packed under eye gel pads that you apply in the morning. I like to keep mine in the refrigerator. They have a cooling affect on my eyes. Plus, I keep them on for 15 minutes when needed in a quiet room away from all distractions. It's my little oasis! I have been relying on these masks all summer long to repair my daughters' hair. Chlorine-soaked locks that are too dry and knotted to almost brush through require a strong moisturizing treatment. This treatment restores moisture and shine to damaged hair and has become a once-per-week must-do for us. I hate to admit it, but most nights this summer I've been almost too exhausted to properly wash my face. I've been waking at 5:30 am to hit the gym most mornings, and by the time 10:00 pm rolls around, I'm finding it difficult to spend more than 2 minutes in the bathroom at night...and that includes brushing and flossing. I've been reaching for Simple's cleansing water. Dab some on a cotton ball and wipe it all over your face. There's no need for rinsing or cleansing afterwards. You can simply apply your nightly moisturizer and hit the pillow. To see more of my favorite beauty products, visit my Beauty board on Pinterest.